Some partisan women in the All Progressive Congress have threatened to storm Abuja n*ked soon over Akinlade. 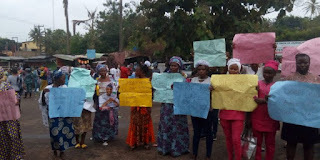 Protests have continued to greet the outcome of the governorship primary of the All Progressives Congress (APC) in Ogun State, as scores of women from the three senatorial districts, yesterday, took to major streets of Abeokuta metropolis, to protest the alleged imposition of candidates in the state, Sun News reports. The women also threatened to occupy the Federal Capital Territory, Abuja, naked, tomorrow, if the National Working Committee (NWC) and the APC National Chairman, Adams Oshiomhole, fail to announce the consensus candidate of the party, Adekunle Akinlade, as the substantive governorship candidate of the party in the state. Deputy Governor, Yetunde Onanuga, while addressing the protesters, who later stormed the Governor’s Office in Oke-Mosan, said she was ready to follow them to occupy Abuja. Armed with placards with various inscriptions, the protesters also stormed the secretariat of the Nigeria Union of Journalists, Oke-Ilewo, Abeokuta, and accused the NWC of announcing an aspirant “who is not popular” as the party’s governorship candidate. Addressing newsmen, APC Women Leader, Shade Giwa, claimed the party voted for Akinlade during the primary election on October 2, and he emerged as the winner, but the electoral committee announced Dapo Abiodun as the winner. “The electoral committee should be warned, Oshiomhole should be warned, he should release our mandate, we give him till Friday to announce the result or else, by Saturday, we will meet him in Abuja. “We want Nigerians to know that we, in Ogun State, are of Ogun standard and we cannot take anything apart from that. In the party primary recently conducted in Ogun, we voted for Akinlade, we don’t know Dapo. “Akinlade is the one who all APC women voted for and anything apart from Akinlade is a no to us. “We are warning the NWC, led by Oshiomhole, because women are going to take action if they fail to announce Akinlade as the party candidate before Friday. We are going to storm Abuja to express our displeasure and we will go naked,” Giwa said.